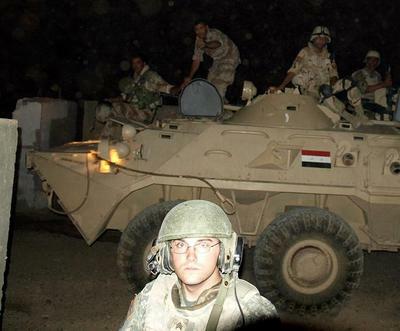 The accompanying low-quality picture shows Sergeant Kenneth Gibson, of Alpha Company’s 3rd Platoon, 1st Battalion, 14th Infantry Regiment, alongside the Stryker Infantry Carrier he was helping offload at Checkpoint 120, about a mile from Alpha Company’s main headquarters in downtown Tarmiyah. A few other pictures of him were taken in the dark of late evening, June 9, 2008. This is the best of a poor lot. He didn’t seem to mind the camera flash going off in his face. But he did finally say, “Flash is bright, huh?” which was taken as an invitation to stop taking his picture. Gibson was a vehicle commander who stayed with his Stryker during long missions. His platoon received the least amount of coverage during a recent embed. Photographic opportunities of him didn’t occur again. Embedded reporters meet plenty of soldiers that are never spoken to at length. A picture might be taken and maybe there’s a brief chat, then the reporter moves on to the next thing. A reporter sometimes lets stories slip away. This picture’s quality is weak and amateurish. The picture’s subject, Sergeant Kenneth Gibson, 25, from Christiansburg, Virginia, was the precise opposite. The US soldier, Sergeant. Kenneth Gibson, was moving civilians he believed were too close to a US cordon around a bomb when twin suicide bombers attacked, according to Lt. Col. Thomas Boccardi, 1st/14th commander. Two other US soldiers were injured, but Boccardi said they would be fine. As many as 17 Iraqis were killed, including police, Sons of Iraq members, and “toddlers, teens and women,” Boccardi said. Boccardi said it was a “pre-planned, deliberate attack,” that involved a bomb specifically planted to draw in first responders, followed by the suicide attack. The U.S. Department of Defense issued the following news release:The Department of Defense announced today the death of a soldier who was supporting Operation Iraqi Freedom.Sgt. 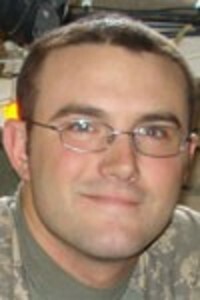 Kenneth B. Gibson, 25, of Christiansburg, Va., died of wounds suffered Aug. 10 in Tarmiyah, Iraq, when an improvised explosive device detonated near his position during dismounted operations. He was assigned to the 1st Battalion, 14th Infantry Regiment, 2nd Brigade Combat Team, 25th Infantry Division, Schofield Barracks, Hawaii. Kenneth B. Gibson, who grew up in southwest Virginia, was remembered last night by someone who knew him as a child as sweet and outgoing. "He was fun to be around," said Sabrina Scaggs of Riner, Va. "You had to love him." ...Friends and neighbors said Gibson was a 2001 graduate of Christiansburg High School in Christiansburg, Va., near Blacksburg, and had worked in a supermarket during school. "He was always willing to help people," said a former neighbor in Christiansburg. "He was a nice, very likable young man." A "real nice guy," said another former neighbor. Scaggs knew him particularly well. She had been his baby sitter when he was in grade school and saw him grow up. He was an irresistible, "gotta-love-him kind of guy," she said. "You had to love him, because he was just adorable," she said. "Absolutely adorable." People liked to be with him, she said, and in addition, he was " a very smart young man." One example of his thoughtfulness, she said, was the sacrifice he made to join his parents in attending her wedding, on his 13th birthday. For a teenager, she said, it's "a big deal" to give up the chance to celebrate with his own friends. According to the Army, Gibson enlisted on March 6, 2002. He apparently had reenlisted at least once. I want to express my condolences to the family, friends and comrades he left behind. I am so sorry for your loss. God speed Sgt Gibson. You are a hero. Multi-National Force-Iraq, a U.S. command in the country, said a U.S. soldier and four Iraqis were killed, and others were wounded, during a "complex attack" Sunday in the largely Sunni Arab town of Tarmiyah, about 15 miles north of Baghdad. The attack occurred about 2 p.m. Iraq time. After an initial improvised explosive device detonated, a team of soldiers was sent to investigate, the U.S. command said. Shortly after the team arrived, a suicide attack occurred and was followed by small-arms fire. The attacks also wounded two U.S. soldiers, 15 Iraqi civilians, three Iraqi policemen and three members of the "Sons of Iraq," Sunni Arabs working with U.S. forces to maintain security. Witnesses and police said the bombers were a group of men disguised as members of the Awakening, another name for the Sons of Iraq, the Los Angeles Times reported. The men entered the house ostensibly to search it, but planted bombs. After the first blast, Iraqi and U.S. forces arrived, the Times said. The suicide bomber mingled with the crowd and detonated explosives worn in a vest. The police initially said the bomber was a woman but later reported that there was no confirmation of that, the newspaper said. He leaves behind a wife, Nikki, to whom he was married for six years; his parents, Athena and Robert Gibson of Christiansburg; and a sister. Pat Davis of Shawsville, the grandmother of Gibson's wife, said though Gibson didn't talk about his work much, he believed in what he was doing. "I do remember asking him one time, I said, 'Kenny, do you really think it is all worth it, for our men and women to be over there?' And he said, 'Oh yes.' " Davis said. Davis also noted that Gibson cherished her granddaughter. Gibson joined the Army in March 2002 and was assigned to Schofield Barracks in August of that year. A teacher at Christiansburg High School, from where Gibson graduated in 2001, said he had always noticed that Gibson possessed leadership qualities. "His decision to join the Army didn't surprise me at all," said Dan Swafford, who teaches agriculture at the high school. Gibson was a hard worker who always tended to his assignments and was somewhat quiet, Swafford said. Swafford said Gibson was a family friend, close to his daughter and stepson in their younger years. "He was always a good kid. I was saddened to hear" of his death, Swafford said. Christiansburg High will honor Gibson, who once played football for the Blue Demons, with a moment of silence at its first home game Aug. 22. The marching band will also perform taps and release blue and gold balloons. Gibson's parents declined to comment on Tuesday afternoon. As of Tuesday evening, no funeral arrangements had been set. I just learned of Sgt Gibson's passing and was deeply saddened by it. I met him when he was fresh out of Basic Training and knew right away that he was a good man. My deepest and heartfelt condolences to his wife and family. I am deeply saddened to learn of the passing of Sgt. Gibson; God Speed Sgt! Though I never met the man, I still feel a strong kinship to all of my inafntry brethren. It also struck me that this man joined the Army six years (to the day) after me-it made the news of his loss all the more personal. My deepest condolences to Sgt Gibson's wife and family; a good man has been lost and will be remembered as a hero. I knew Gibson from 03' to 06' and there was never a time when i didn't have a smile on my face from what he said. Gibson was truly a influential soldier. Dwayne Williams 1st PLT,Aco. 1-14th Infantry Schofield Bks, Hawaii 2003-2006. I'll miss you Gibson. I didn't know Sgt. Gibson as well as I'd have liked. We'd talked enough times for me to know he was a great guy. He was the guy that had no enemies. Not a single person could say a bad thing about him, and he was respected by every man in the company. Alpha Company is missing one of it's best soldiers. It was a privelage and honor to have known Gibby. He had a way about him that was contagious. I will always cherish conversations we shared, and will miss him deeply. He has touched all those who knew him, and changed our lives forever. Your family is in our prayers...God Bless Brother. I met Sgt.Gibson when he was a private when I came back from Bosnia. Sgt. Gibson was a kind man and a dedicated soldier. It was an honor to serve with Sgt. Gibson and I send out my deepest condolences to him and his wife Nikki. I really liked this blog, very well prepared and with good topic of discussion. You are not the average blogger, dude. U surely have something important to contribute to the net.